Whitespace is situated in a converted warehouse in Ponsonby on the city fringe in Auckland. Directors Deborah White and Kenneth Johnson represent many of New Zealand’s senior artists alongside outstanding emerging and mid-career talent. Whitespace presents a vigorous exhibition programme of New Zealand and Pacific contemporary art, with regular international projects, and are committed to many public and community art projects. Bob Kerr pairs significant historical narratives with illustrative landscapes to give insight into New Zealand’s past and people. Bob Kerr’s creative practice combines his two artistic endeavours: painting and writing. Through the eyes and voices of scientists, conscientious objectors, and war veterans, Bob tells the story of New Zealand’s history, people, and the landscape. His historical landscape paintings are often unidealised and raw, revealing the stories embedded in the land and showcasing a beauty we may otherwise overlook. Although largely inspired by stories of historical figures, Bob’s paintings are regularly devoid of people but suggestive of a human presence. Bob invites the viewer to put themselves into the landscape and imagine what events have occurred there; his paintings do not offer answers, but present questions. His paintings have an illustrative and narrative quality, which reflects Bob’s position as an artist and author. Through a clear and clever use of colour and texture, he gives an insight into stories that are both personal and historical. Bob Kerr was born in Wellington, and has a DipFA (Hons) from The University of Auckland. He has written and illustrated a number of children’s books, receiving the Best First Children’s Book Award in 1993 for The Optimist (1992). 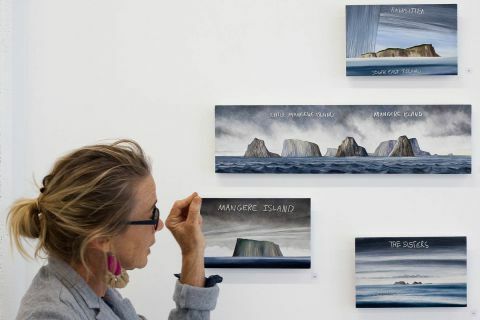 His paintings are held in private collections across New Zealand and overseas, with his best-known work appropriately appearing on the cover of Michael King’s book The Penguin History of New Zealand (2003). When we visited the gallery we met NZ artist Davina Stephens and she illuminated us about Bob’s oil painting technique… Interesting!